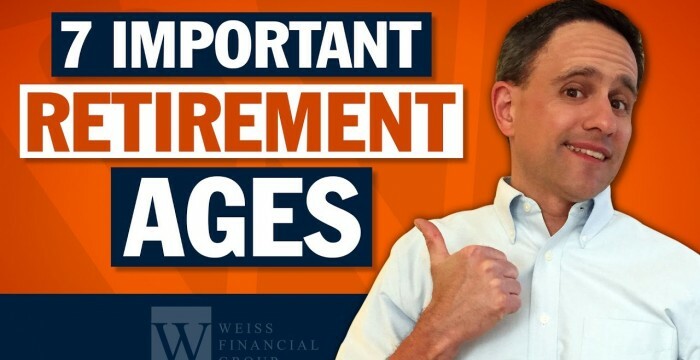 Here are the 7 ages you should know for your retirement and the impact these milestones have on your retirement. Learn the 8 Steps to Organize & Optimize Your Financial Life: . Scott Weiss is a Fee-Only Certified Financial Planner. Finally, age 70 ½ . When you turn 70 ½ you will be required to start withdrawing specified amounts from your 401(k)’s and IRAs. This is called your Required Minimum Distribution or RMD for short. You must begin these withdrawals once your turn 70 ½ but you actually have until April 1st of the year following the year you actually turn age 70 1/2 . I know, confusing right? Let me give you an example. Let’s say you turn 70 ½ in January 2016, you will need to take your RMD by April 1st, of 2017. Now, you can take it in 2016 but you don’t have to. Going forward, every year after your first RMD you will be required to take the distribution buy December 31st. That’s a lot to remember so check the show notes for all the details. Leave me a comment to ask any question or contact me through my website if you'd like to see if I can help you. This entry was posted in medicare supplement and tagged age to retire, ira age 70 mandatory withdrawal, IRA Required Minimum Distributions, ira rmd, medicare, medicare age 62, medicare age start, planning for retirement, Required Minimum Distribution Rules, required minimum distributions, retirement planning, RMD, scott weiss cfp, social security age, social security age 50, social security age 62, social security age 66, social security age 70, Social Security Benefits, social security retirement age. Bookmark the permalink. The 70.5 number is a bunch of crap because if you wait till 70.5 then you have to take 2 withdrawals in the same year and pay at a higher tax rate and more of your Social Security will be taxed. Rollover into a Roth or withdraw as much as you can before you get to the mandatory age. My number now is $372602. The math is $13600 divided by .0365. Thank you for the comment Everett. If you take your RMD in the year you turn 70 1/2 you will only have 1 RMD. However, if you wait until April 1st of the year following the year you turn 70 1/2 you are correct that you will end up taking 2 RMDs in one year. That could affect your Social Security taxation but it depends on your specific tax situation and how much your RMD is. Also, if you rollover your Traditional IRA into a Roth IRA it is a good idea to have funds available for taxes outside of your Traditional IRA. The rollover could also impact how much your Social Security is taxed so it is a good idea to consult with your tax professional before making those moves.